I absolutely love everything Girl Scouts! It is not just a place for young girls to come together and make friends, but an outlet for learning new skills and passions. In my past I was a Scout, and some my favorite childhood memories came from the meetings and retreats we shared. I remember all the sights and smells of my very first camping trip we took as a Brownie troop. I developed my love and passion for bon-fires and marshmallows. We sat around the campfire singing songs and bonding over scary stories told with a flashlight on our faces. One memory that I will never forget is the night I spent sleeping on the floor in the cabin in the woods, waking up to a small mouse crawling on me. The little guy spent the night curled up in my bag with me and was coming out for a snack. Although at the time it was my worst nightmare, I remembered how we all stuck together on top of the counter, while our brave leader caught and released the mouse. I was recently called back to being involved with the girls and I literally can’t wait! I wanted to help in a way that would speak to the young generation’s heart and provide a foundation that will last into their adulthood. As a children’s author I feel I am called to inspire girls to reach beyond their normal day life, and exploring who they are and what they can only dream of becoming. As the meetings are about to begin I have planned ways to get involved in my local council and throughout the country. One of the ways is for me to come and chat with the ladies on how to write a book, and teach them that everyone has a story to tell. I want the girls to have a one-on-one experience in an environment that is comfortable to them as well as an opportunity to learn. 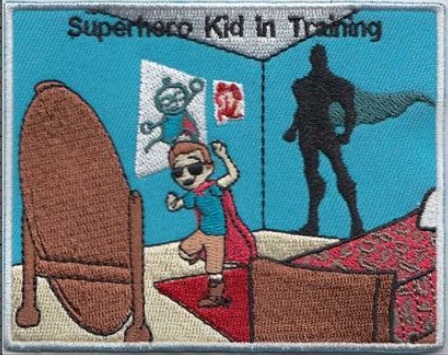 I also have a reading patch that the girls can earn after reviewing my book (Superhero Kid in Training) and exchanging a letter of correspondence. This idea was given to me from a dear friend who leads a troop in Texas, and it has taken off in several areas around the US. This upcoming season is so exciting to me on a personal level. I believe that the Girl Scout leadership experience can instill confidence, courage, and character. This is something I want to be apart of in any way possible. Let me know if your troop would like to book an event, I would love to attend a meeting or assist in any upcoming project you may have. Looking forward to meeting everyone!